This Roasted Sweet Pepper Chickpea Soup is delicious and easy-to-make. 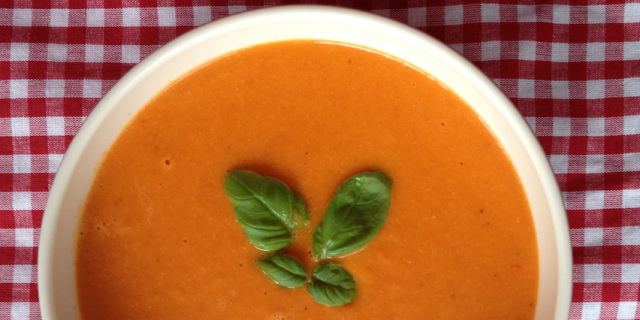 This Roasted Sweet Pepper Chickpea Soup is another delicious and easy-to-make soup. The pure and natural flavours of the sweet peppers, shallots and tomatoes are brought out by roasting these wholesome ingredients in the oven first. Roasting is great as it leaves you with more time on your hands to do other things. When the roasting is done, you simply need to add the stock, oven mixture and chickpeas to a high-speed blender, blend until smooth and you are ready. It does not require any additional cooking. The chickpeas add some heartiness to this soup so you can enjoy it even as a complete lunch or dinner. I like to top it off with lots and lots of fresh basil to add some freshness to it. 1. Preheat the oven to 180 celsius and place the sweet pepper, garlic, tomatoes, chili pepper & shallots in a roasting tray. Add olive oil and sprinkle with salt and pepper. Mix well. 2. Bake in the oven for 50- 60 minutes. Mix once in a well to make sure the mixture is evenly roasted. 3. In a large saucepan heat up the tomato vegetable stock. 4. In a high-speed blender place chickpeas, the stock and the oven mixture including the juice. Add 2 tbsp of apple cider vinegar and blend on medium speed until smooth. 5. Serve with fresh basil leaves.